We are offering Bed Pillows. Our company is in this line of work since past several years and has gained expertise in manufacturing, supplying, wholesaling and exporting Cushion Covers at a larger extent. Although Vintage cushion Covers and decorative pillows and home decor accessories seem an essentially modern element of decorative life, they have been used since furnishing began. Throw pillows, wall hanging decor, and window coverings and curtains today are an integral part of any interior decoration. Decorative throw pillows, bedding pillows, wall hangings, and window curtains, each of these home accessories, when used in the right way, can bring a home decor scheme together perfectly. Used to break up what may be boring expanses of upholstery or wall space, the very existence of decorative pillows and home accessories makes a room personal, comfortable, and trendy. Our funky decorative pillows and our unique home decor accessories are designed by our in-house designers in collaboration with rural artisans. Sure to add pattern, color and funky flavor to any room, transform your home with decorative pillows and home accessories from Vishal handicrafts. Made entirely from re-purposed vintage cotton saris, each soft, brilliantly hued design is intricately hand-quilted by women artisans in India. The entire technique used for preparing printed Tropicana Pillow Covers is termed as quilting. These covers have occupied its own place in the market and it has been utilized by a large number of people. It can also be considered as decorative item as they are widely used for home decoration in a very stylish way. 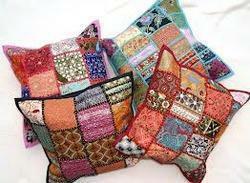 Patchwork Cushion Covers from old, precious wedding saris and Dresses are patched together with heavy hand embroidery, bead work & sequin work at random to create a collage like effect. Each patch on each cushion is uniquely hand embroidered and no two patches are alike, which makes every pillowcase one of a kind. 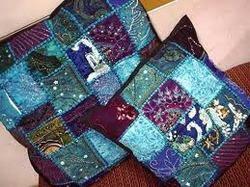 This unique patchwork Floor Pillows from India are completely handmade and absolutely stunning. 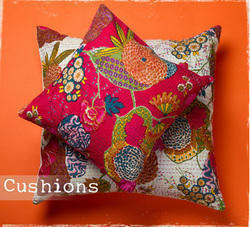 This Handmade floor Pillow is created using vintage tribal fabrics of local villagers in Rajasthan, India. 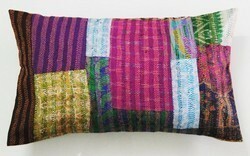 It can be used as decorative throw cushion or floor cushion or sofa pillow. Vintage patches from old, precious wedding saris and Dresses are patched together with heavy hand embroidery, bead work & sequin work at random to create a collage like effect. Each patch on each cushion is uniquely hand embroidered and no two patches are alike, which makes every pillowcase one of a kind. Quilted Pillow Covers and decorative pillows and home décor accessories seem an essentially modern element of decorative life, they have been used since furnishing began. Throw pillows, wall hanging decor and window coverings and curtains today are an integral part of any interior decoration. Decorative throw pillows, bedding pillows, wall hangings and window curtains, each of these home accessories, when used in the right way, can bring a home décor scheme together perfectly. Used to break up what may be boring expanses of upholstery or wall space, the very existence of decorative pillows and home accessories makes a room personal, comfortable and trendy. Our funky decorative pillows and our unique home décor accessories are designed by our in-house designers in collaboration with rural artisans. 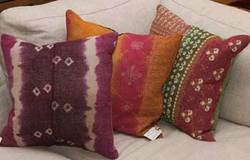 Sure to add pattern, color and funky flavor to any room, transform your home with decorative pillows and home accessories from Although Vintage kantha quilt pillow covers and decorative pillows and home décor accessories seem an essentially modern element of decorative life, they have been used since furnishing began. Throw pillows, wall hanging decor and window coverings and curtains today are an integral part of any interior decoration. Decorative throw pillows, bedding pillows, wall hangings and window curtains, each of these home accessories, when used in the right way, can bring a home décor scheme together perfectly. Used to break up what may be boring expanses of upholstery or wall space, the very existence of decorative pillows and home accessories makes a room personal, comfortable and trendy. Our funky decorative pillows and our unique home décor accessories are designed by our in-house designers in collaboration with rural artisans. Sure to add pattern, color and funky flavor to any room, transform your home with decorative pillows and home accessories from Vishal handicrafts. 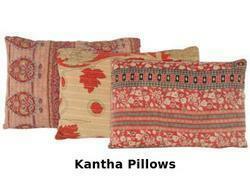 Vintage Kantha Cushion Cover, bedding pillows, wall hangings and window curtains, each of these home accessories, when used in the right way, can bring a home décor scheme together perfectly. Used to break up what may be boring expanses of upholstery or wall space, the very existence of decorative pillows and home accessories makes a room personal, comfortable and trendy. Our funky decorative pillows and our unique home decor accessories are designed by our in-house designers in collaboration with rural artisans. 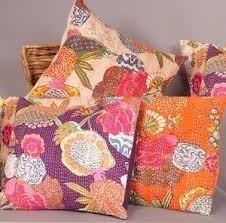 Sure to add pattern, color and funky flavor to any room, transform your home with decorative pillows and home accessories.